After finding out that his girlfriend is on a mission to kill him, Nick Gautier doesn’t know who he can trust anymore. His now ex-girlfriend Kody is the least of his worries, though. Someone else is working very hard to get Nick to embrace the part of him that’s a demon with the potential to destroy the world. Nick is trying equally hard to avoid this future, but it’s not easy when everyone seems to be plotting against him. Since reading Infamous, the previous installment in the Chronicles of Nick series, I’ve read some of Sherrilyn Kenyon’s adult Dark-Hunter novels, from which Chronicles of Nick was spun off. I was amused to see that adult Nick is just as much of a wiseacre as teenage Nick is. In addition to becoming reacquainted with the wit of the younger version of Mr. Gautier, I was looking forward to reading Inferno to see which Dark-Hunter characters made appearances here. Nick is now sixteen, and there’s a darker, more grown-up tone to Inferno. I’ve never been big on the subplots revolving around some kind of drama at Nick’s school, and I was glad to discover that there wasn’t one this time. 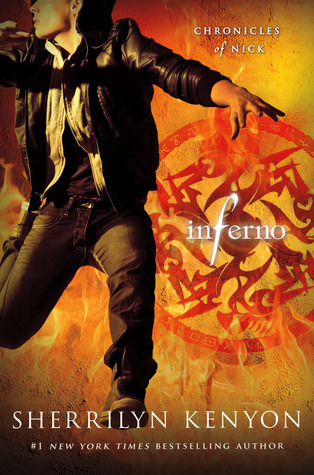 Instead, Inferno focuses on a plot to get Nick to come into his full demon powers and ensure the apocalypse. Things have been slowly building to this point since the first book, Infinity, but with Nick well on his way to adulthood, there’s a greater urgency than ever to preventing him from going all evil. The length of the book was somewhat of an issue for me. There are quite a few pages devoted to Nick’s self-doubts. Despite how far he’s come from eking out an existence, he fears that all the good others see in him won’t be enough to stop him from becoming a monster. I thought some of these internal monologues could have been trimmed. They felt repetitive after a while and slowed the flow of the story. Something that I think Kenyon does very well is make you reconsider your initial opinion of a character, typically for the better. Just when you’re set to write someone off as a complete villain, she supplies you with that character’s utterly gut-wrenching backstory. I’ve always been wary of Caleb Malphas, a demon who serves, albeit reluctantly, Nick’s nefarious father, Adarian. Caleb poses as a human student at Nick’s school, and Nick, though he knows what Caleb really is, regards him as a friend. It turns out that Caleb has a rather tragic past; I felt quite sorry for him. Gaining some insight into his character in Inferno also convinced me that Caleb really does want to help Nick. Of course, there’s always the possibility that Kenyon will have the character make a turnaround, thus making me take back everything complimentary I’ve just said about Caleb. While Inferno represents some steps forward in the series in terms of character development and sticking to the main plotline, the story does drag in some places. The humor that I love so much about these books is as funny as ever, though, so I was still very entertained by this. And there’s a scene in which my favorite zombie hunters, Bubba and Mark, have flamethrowers. Enough said. I really enjoy this series, but I think the story in Inferno could have been told in fewer chapters. Otherwise, this is another solid entry in the Chronicles of Nick series with an ending that I’m dying to see resolved in the next book. Seriously—I can’t wait to find out how the story picks up from here. Infinity was the first Kenyon book I read, and at first I found the world a bit hard to grasp. I loved Nick's sense of humor, though, and it was much easier to get into the second book, Invincible. I love it when an author can make you rethink what you think of a character. In reality, we all have good and bad sides to us and characters should be the same. It takes talent to show the many facets though and I really appreciate it when it's well done. Great review! Jaclyn @ JC's Book Haven. She's an ace at showing you the different sides of a character, particularly in her adult series, which I'm quite addicted to at the moment.